The Bill Murray Experience: No, not that Bill Murray, but quite an experience! | Will You Miss Me When I'm Gone? The Bill Murray Experience: No, not that Bill Murray, but quite an experience! Will You Miss Me When I’m Gone? knew nothing about The Bill Murray Experience until a couple of days ago, when the old-timey New York City based band was featured in this New York Post video about Play Me, I’m Yours, the art project that has put 60 pianos — available for anyone to play — in public places around New York City. How we’ve missed them is a mystery. 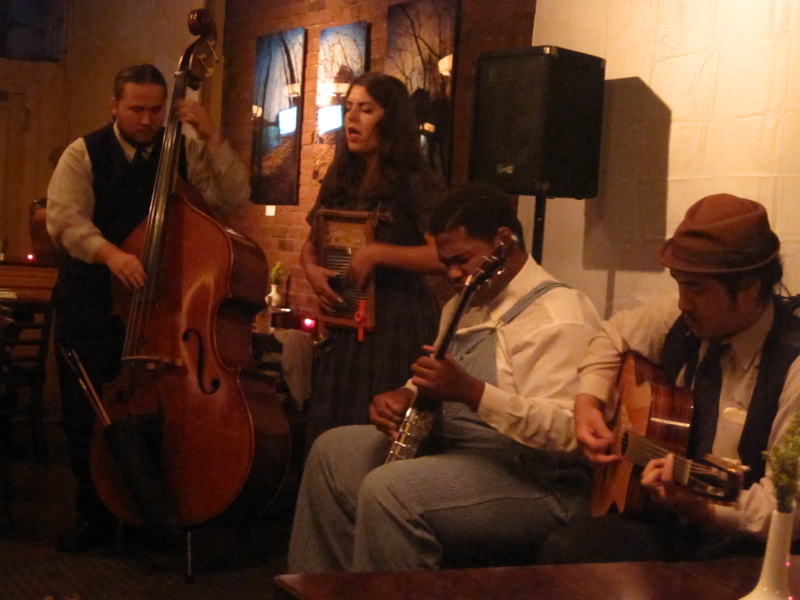 They are fantastic, and proved it last night in performance before a small and not entirely attentive crowd at The Cupping Room Cafe at West Broadway and Broome streets in Manhattan’s Soho neighborhood. Peter Stampfel, of Holy Modal Rounders fame, knows a thing or two about this kind of music. And he sums up the band’s primary appeal quite well — it’s Jessy’s emotive and engaging singing. “She doesn’t sing songs as much as she embodies them. Her singing and moves are both about as good as it gets,” Stampfel says. But Jessy needs the rest of the band to pull it off. Her interplay with the players — especially the jovial, overall-wearing Paxton — is charming adds so much to the overall feel of the performance. BME plays around NYC quite a bit, at places like the “secret” Shanghai Mermaid, 893 Bergen St., Brooklyn, where they play at 9 tonight, June 26 and at the Jalopy Theater, 315 Columbia St., Red Hook, Brooklyn, where they’re performing at 8 p.m. Monday, June 28. Here’s a clip of the band that gives you great sense of its joyous, freewheeling style at a June 20 show at the Main Street Museum in White River Junction, Vt. This entry was posted in Blues, Folk, Jazz, Music, News, Pop and Rock, Theater and tagged Coffee and Cigarettes, I Ain't Got Nobody, Jalopy Theater, Jim Jarmusch, Leon Redbone, My Melancholy Baby, Peter Stampfel, Shanghai Mermaid, The Bill Murray Experience, The Cupping Room Cafe. Bookmark the permalink. Pingback: New Speed the Plough — live on the Fourth of July « Will You Miss Me When I’m Gone?